The construction of Interstate 35 created a deep divide in Austin, Texas. By the 1980s new investment flowed west of the highway, depriving East Austin of economic opportunities and creating an underserved community. The 700-acre Mueller Municipal Airport was an industrial use and void in the fabric of East Austin. When talk of airport expansion began, the neighborhoods came forward with a demand to move the airport and with a vision of redeveloping the site into a sustainable, diverse, affordable community to help revitalize East Austin. When voters agreed to move the airport, the city launched a public planning process that embraced the neighborhood's vision of redevelopment and engaged citizens in the creation of a master plan. City planners soon realized the property value of the existing site was $60 million short in funding for the ambitious redevelopment. The city found its answer in a partnership with master developer Catellus; a financing plan was created that paid for the shortfall. The current development program projects property values to be over $1.3 billion at completion. 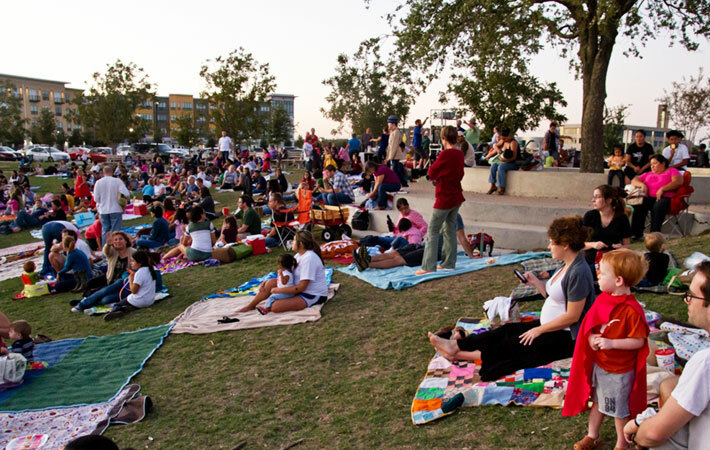 Mueller's public parks bring neighbors, new and old, together for community events including Movies in the Park, concerts, farmer's markets, and citywide nonprofit fundraisers. In the years since reinvestment began, Mueller has transformed from an empty airfield into a bustling community of housing, jobs, and commercial development, offering opportunities for citizens of all income levels. Since 2006, 2,302 residential units have been completed or are undergoing construction. Twenty-five percent of all homes are set aside for affordable housing for families making less than 60 to 80 percent of median family income. New employers, including the Children's Hospital, a grocery store, and Austin School District Performing Arts Theater, have established new job opportunities for the area. Surrounding neighborhoods are connected to these opportunities by a multi-modal street network, along with 13 miles of trails and 140 acres of public parks. Community involvement has been a hallmark of the Mueller planning process. In 1984 the Citizen Airport Relocation Plan (CARE) was a grassroots effort of adjacent neighborhoods that generated the vision for the site and established the redevelopment goals in place today. Public participation has occurred at every step of the redevelopment process including recent public workshops on the forthcoming Town Center and school opportunities. In total, city officials and Catellus have held more than 200 public meetings with focus groups and the general public. Innovative funding mechanisms, including tax increment financing, are bringing to life the shared vision of long-time and new residents alike. Other tools such as a shared equity program are making homeownership a reality for some and increasing access to affordable units for others. Financing for Mueller parks is unique in that, after public parks are constructed, maintenance is primarily privately funded with a contribution from the city. 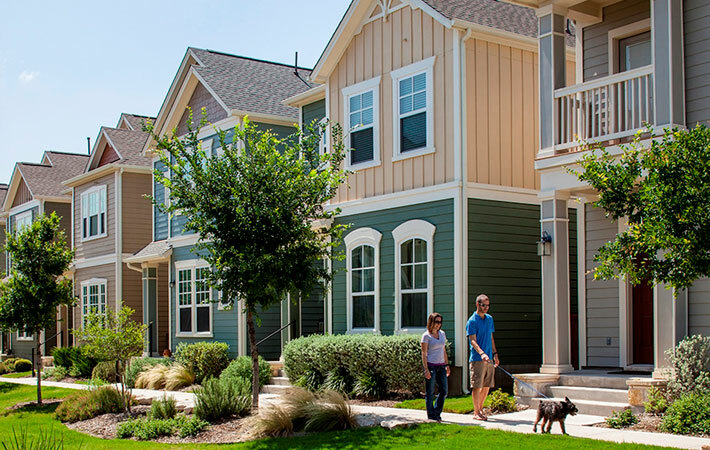 Mueller's commitment to sustainability is underscored by the requirement that all buildings in the community must meet green building standards, resulting in the largest concentration of green and LEED certified buildings in Austin. Market rate and affordable housing is interspersed throughout Mueller, including courtyards like this one, where 50% of units are in the affordable homes program. The Mueller planning and development process is delivering a community vision and proving to be a national model for affordable housing, sustainability, and compact development, as well as the public engagement process where citizens have a say in what happens with city assets.